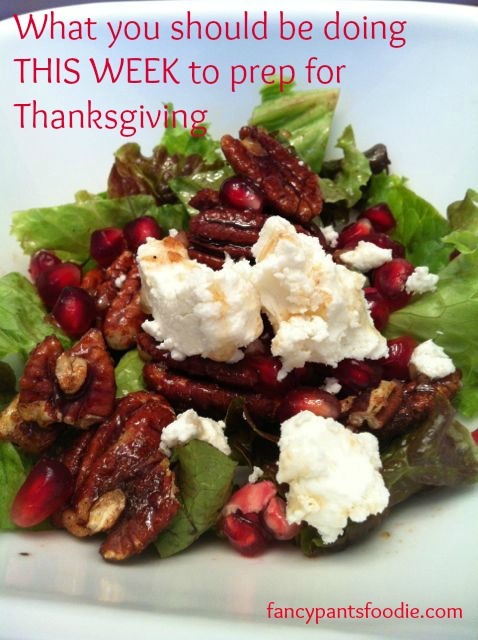 Goat cheese and pomegranate salad from last year’s Thanksgiving. If you, my foodie friend, are cooking Thanksgiving dinner (lunch, whatevs) this year, you need to get it in gear this week. I know. So early! But trust me. You’ll be happier. Every year, the first week of November, I start getting a little twinkle in my eye. Just call me the Santa of Thanksgiving. Maybe you don’t get the same level of excitement, and maybe you don’t even do a T-day meal that’s all that fancy. Even so, this is the week you should start putting a few thoughts that direction. Why? Because it will save you lots of stress and probably a lot of money in a few weeks. You might even like my would-be menu from that Thanksgiving I ended up with the flu. Hey, it’s a start. Embellish at will. Of course, there’s also nothing wrong with making your feast just like your family has done for generations. Just write down the list of every menu item you plan to prepare. Feel free to send reminders this week to family members who typically bring a particular dish. Once you have all your menu items chosen, write down every.single.ingredient you’ll need to make each dish. If you know you have something in your pantry/freezer, make a note, but write it down anyway. Print out all the recipes to help make lists and to have them handy for prep. Holiday meals can be expensive, so a little forethought can help with budget planning as well as sanity. Write on a piece of paper how much money you are going to spend on this meal. Period. No cheating. If you end up adjusting your menu because of it, so be it. Maybe ask relatives to bring some of the items, or even just the ingredients if you want to do it yourself. Just be sure to coordinate with them so you get the items in time to prepare them for the meal. Next, consider how many people you will be feeding and how many leftovers you want. Carefully take note of your recipes where it says how many it feeds, and multiply/divide as needed. If you’re going by recipe-free tradition, just adjust as necessary based on what you know it makes. This step helps make sure you don’t spend too much on copious quantities you won’t use. Now check out the specials at your favorite store, or even one or two that you don’t normally frequent. If you don’t wait until the last minute (and sometimes, even if you do), you can find some really great deals on Thanksgiving dinner items. As mentioned earlier, there are things you can prep and freeze early, so catch some sales and get things moving. Use your ingredient list you made earlier and get your groceries in two phases: Stuff that can be done early, and stuff you want to do later. My family is escaping to the lovely Big Cedar Lodge this Thanksgiving, so I’m planning a small feast that we can prepare in our cabin there. I just purchased some turkey legs ($3) to make into a stock for gravy and dressing. This can be frozen way ahead of time. I’m also going to make some dressing, gluten-free rolls and a pie (maybe two) to freeze ahead of time and carry with us in a cooler, along with a very small turkey, maybe just a turkey breast. Add some bacon-wrapped green beans and a pan of sweet potato casserole and we are SET. What are you having for Thanksgiving this year? Let me know in the comments. 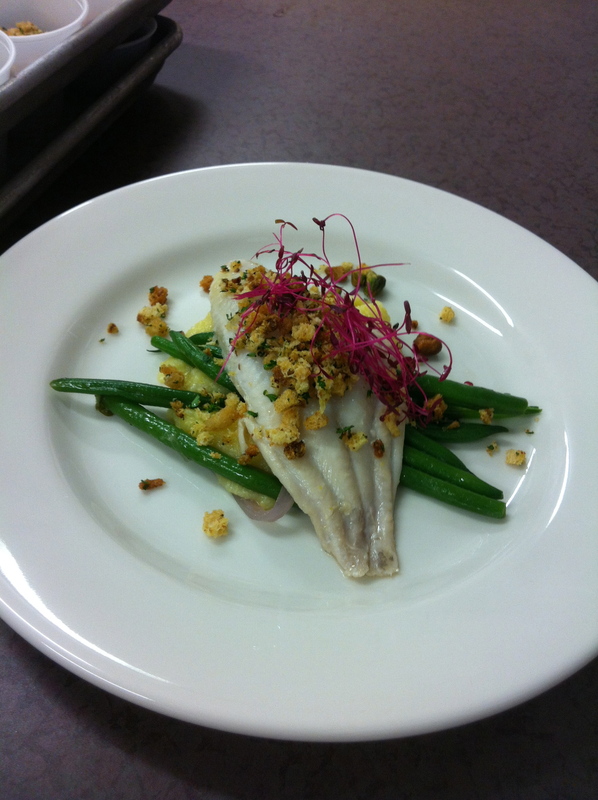 And, as always, if you have any cooking questions as you go, feel free to drop me a line. 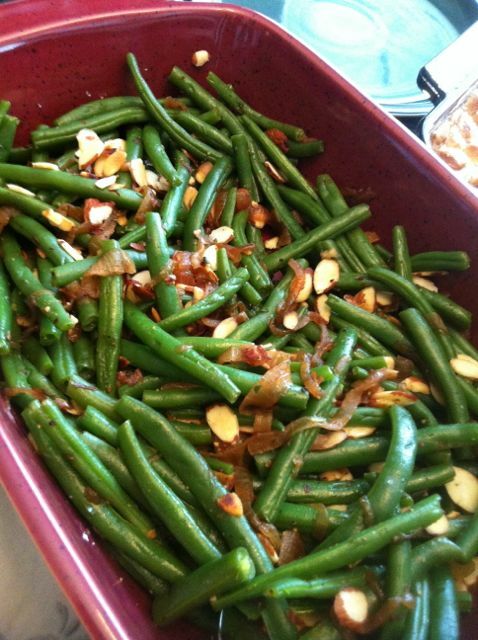 Photo added after-the-fact of the green bean and caramelized onion dish at Easter brunch. 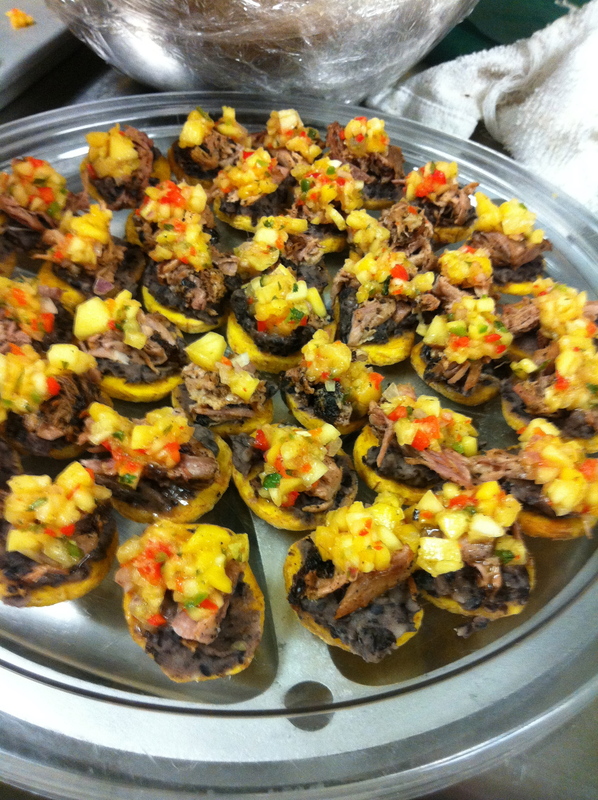 In addition to my part-time gig teaching Cooking Matters with DHS, I’ve done quite a bit of catering with a friend lately, among other smaller paying gigs. 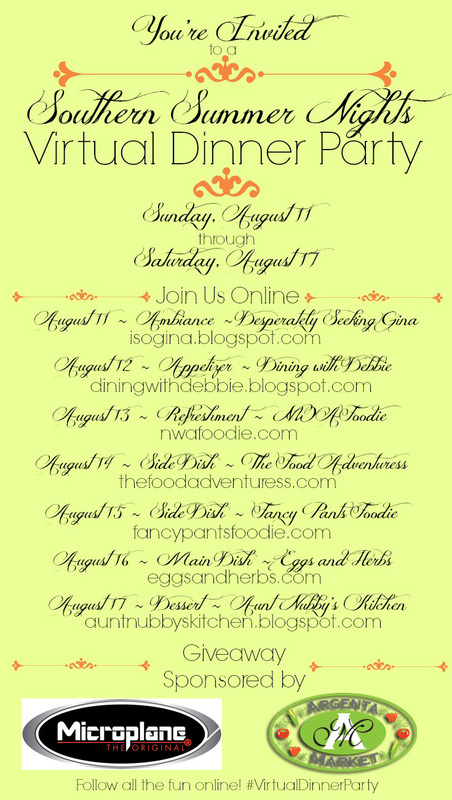 I’m also working full-tilt on the Food Blogger Bake Sale, and somehow I got involved in my 20th class reunion planning. All that to say, this year’s Easter feast is NOT going to be fancy. At least by my standards. 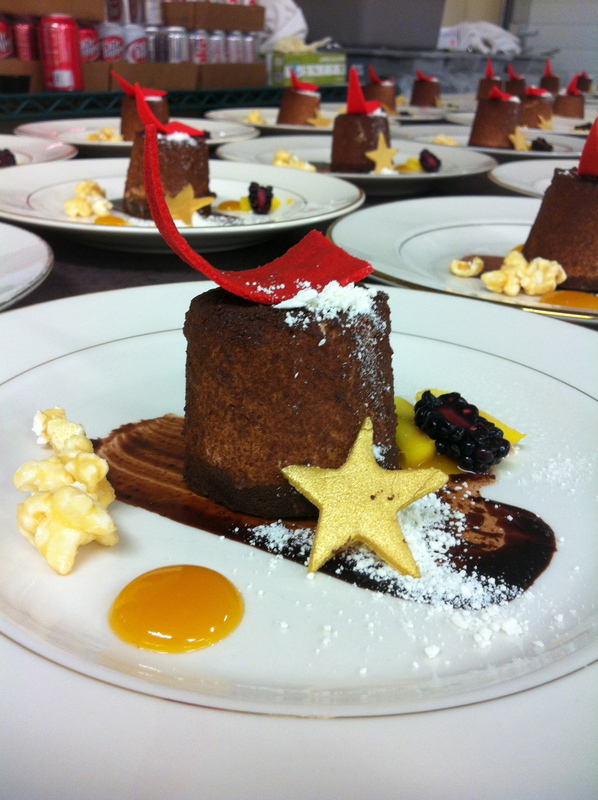 As my catering friend said earlier this week, you get to a point you just have to get over yourself. 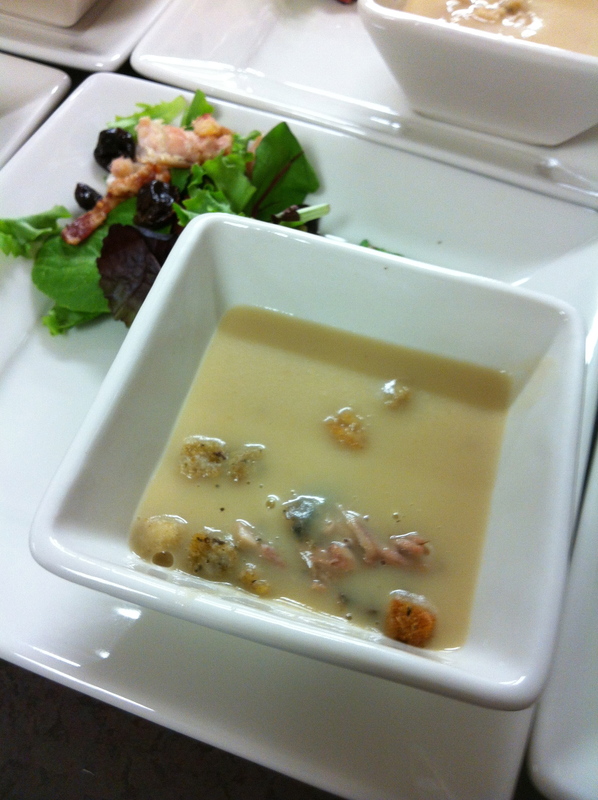 He was referring to catering; we were preparing a pasta-and-salad lunch for a large, very high-profile group of people. For a smaller group, my friend might have made every single thing from scratch, on-site. But when things get crazy (or large-scale), you have to get over what you know you can do and just make something high-quality but simple. I’m working most of today (Friday) and all day Saturday. Church all morning on Sunday. So, no time for an elaborate feast. I chose several items that could employ my favorite “Blanch, Shock and Awe” technique, which I did last night (Thursday) and parked in the fridge. I even bought (gasp) prepared ham, pre-baked rolls and packaged gluten-free cake mix. Ugh! That one still smarts. There will still be plenty of handiwork tonight and Sunday afternoon to soak some love into the meal. But, as I discovered that Thanksgiving a while back, the most important part is where we all sit together as a family. Last night, I blanched and shocked the green beans and asparagus, and I wrapped the asparagus with the salami. I boiled the potatoes and shocked them as well. All those are in the fridge, ready for final steps on Sunday. The two recipes from other sources, the green beans and potatoes, I will probably personalize a bit with things on hand. We’ll see. And the cake… I’ll bake tonight and see how it goes. Not sure when the frosting business is going to happen. 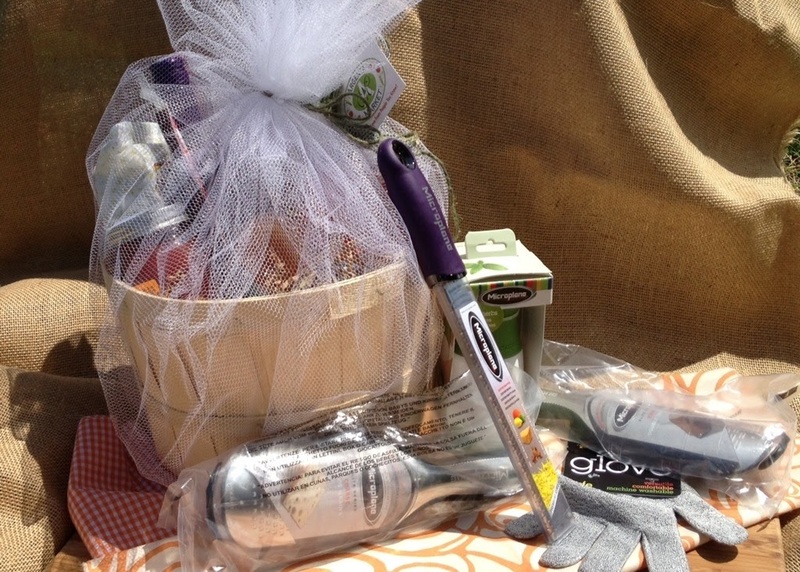 What are you making for Easter brunch/lunch/dinner? For the record: Lisa Gibson Fischer is adorable. 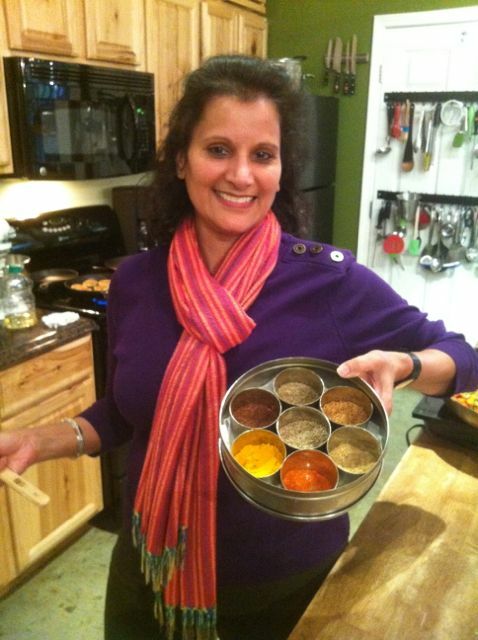 Though she is mostly known in central Arkansas as the effervescent co-host of B98.5’s morning radio show, Fischer is also an excellent cook, hosting the “Made from Scratch” series entry focusing on Indian cuisine at the Rockefeller Institute in Morrilton earlier this month. I felt a little strange cheating on my homies over at Pulaski Tech, but this was subject matter I hadn’t learned yet. I had wanted to take International Cuisine this semester, but it didn’t fit into my mommy-schedule. I also wanted to check out the new Rockefeller Institute, a stunning educational and meeting facility seated atop Petit Jean Mountain. With culinary education all the rage these days, they built a lovely teaching kitchen, with a stadium-seating lecture hall alongside a small hands-on lab area. In the class, we started off with naan bread (a puffy, yeasted flatbread), a chicken coconut curry soup, and a mango lassi (mango puree with yogurt). Shall I interject: I have been SO good lately with the gluten-free thing. 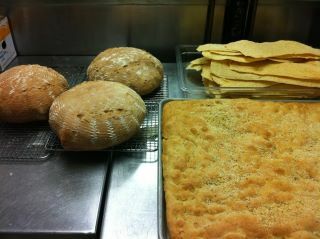 But this day…there was just something about making bread. I hadn’t made yeast bread of any sort since going GF. I. Couldn’t. Resist. 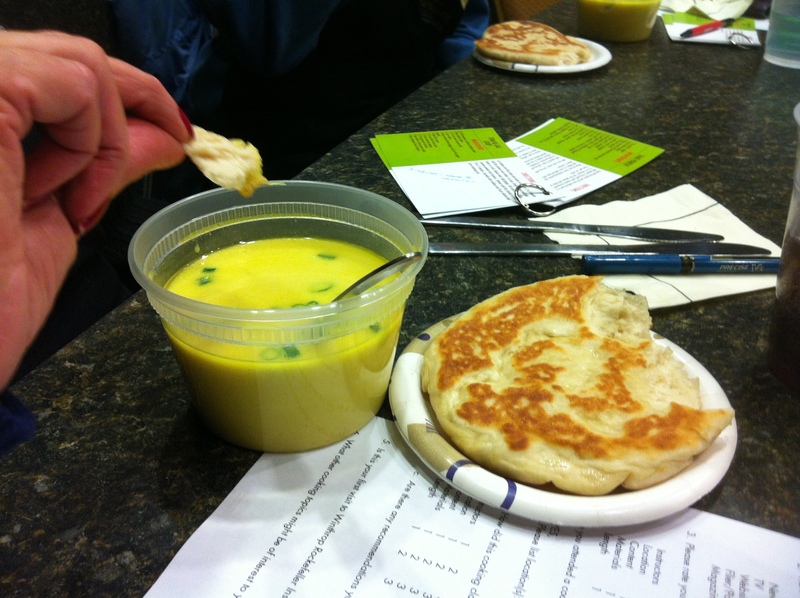 Another participant's lovely naan and coconut soup. I ate at least one whole naan, maybe more. It was in pieces, to feed my self-deception that I would only eat a bite. So, by the time we’re working on the next dishes, my eyes are puffy, I’m exhausted, and my muscles, which have avoided significant pain for several months now, started to cramp and seize. While I sank into glutenized stupor, we made Saag Paneer and Coconut Shrimp Curry, both surprisingly mild and delicious. Surprise bonus: My seating neighbor and lab partner just so happened to be Dr. Meenakshi Budhraja, a gastroenterologist who is on the cutting edge of all things relating to food and/as medicine. She and I have tried for months to get together to finish a journal article we’re co-writing on the topic, and our schedules haven’t jelled. More on that another day. 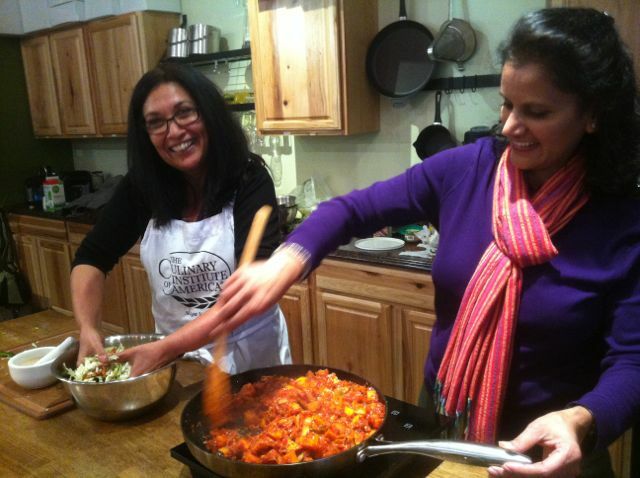 I could go on about all the details of the event, but I’ll just say you should sign up for (1) Lisa’s “repeat” coming up at KitchenCo with the same recipes, and (2) anything at the Rockefeller Institute. It’s a stellar facility with a fantastic staff, culinary and otherwise. Back to the naan. After driving 45 minutes or so home in a glutened haze, I knew I had to come up with a gluten-free version. As of yet, I had only stockpiled GF flours, hoping to one day have the time to play. I made the time when I got home. 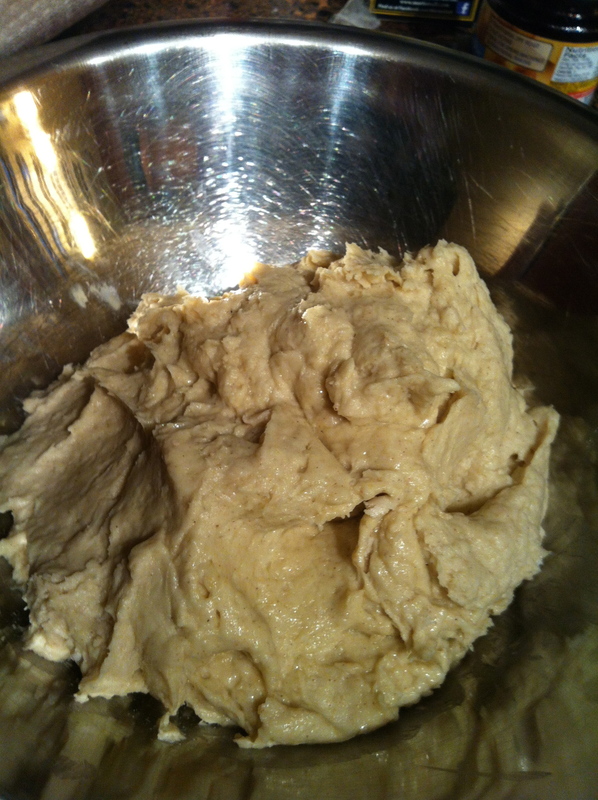 Mix the flours, starch, yeast, salt, and xanthan gum REALLY (no, really) well in the bowl of your stand mixer. I am generally against sifting, so I used a whisk to mix things up thoroughly. You could also use the whisk attachment of your mixer. Now place the dough hook on your mixer and proceed. In a separate, small bowl, break up the eggs a bit with a whisk or fork. In yet another bowl or largish measuring cup, combine the warm water, oil, and honey. Pour the eggs into the flour mixture and mix a few seconds. With the mixer on low, slowly add the water/oil mixture until completely emptied. What’s left in your mixer will slosh around for a few minutes and generally look like a big, sloppy mess. Keep it up. Depending on your local humidity and altitude, and the questionable accuracy of this, my first gluten-free baking recipe, your dough (like mine) might be a bit soft. This is to be expected, really, as GF doughs tend to come out more like batters. Don’t freak. The sticky dough of my gluten-free naan. Cover your dough and let it rise in a warm place for an hour or two. I have a warming drawer now, but I used to just run my dryer for a few minutes and then place the bowl inside. Instant proof box! Now, to form our naan: If you have a Silpat, now is the time to bust it out. This stuff is sticky. Sprinkle on a fair amount of rice flour, a little more if your dough is intolerably wet and sticky. Pinch off a golf-ball sized piece of dough and place it on top of your heavy dusting of flour. 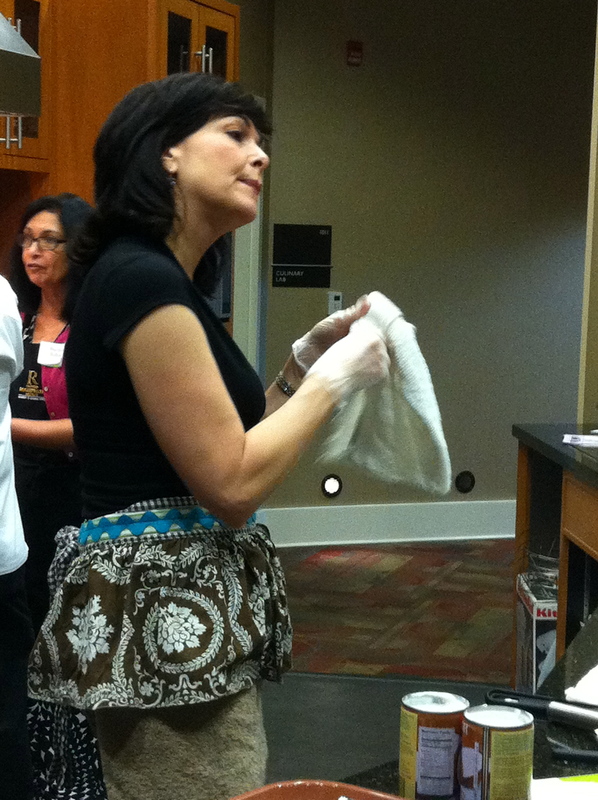 Sprinkle another heavy dusting of rice flour on the top, all over, so it won’t stick to your method of flattening. Rolling out the GF naan. This flattening method is variable, depending on what you’ve got to work with. 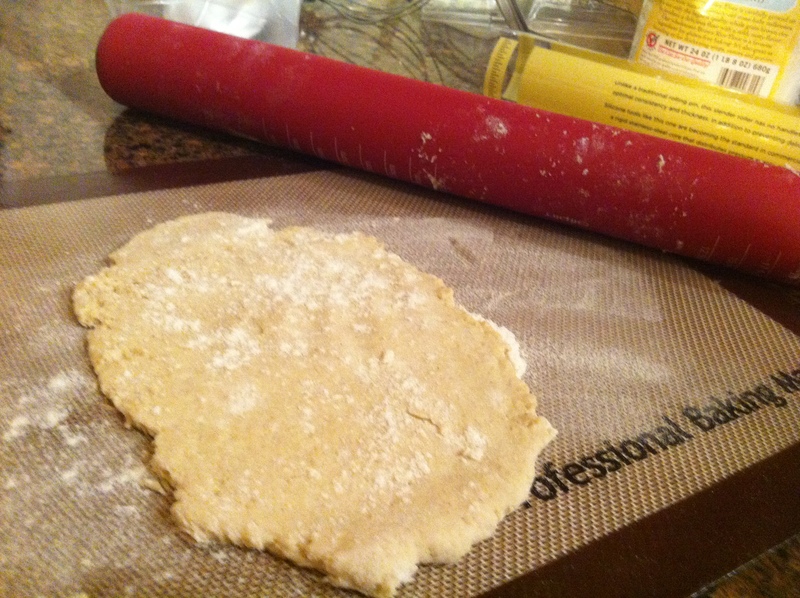 My awesome hubs got me a Silpat rolling pin for Christmas, which was perfect for this. If your hubs isn’t as awesome as mine, you can pat down your naan using a sheet of plastic wrap or a cut storage bag. Either way, get it down to about a 1/8″ thickness. Use a large spatula to loosen the dough and get it off the mat, then use the mat itself (or the spatula, if it’s holding together well) to transfer your naan to a waiting, hot skillet with some oil or butter inside. Oh, yeah. Get that ready first, will ya? GF naan all cooked up on one side, and about to flip. 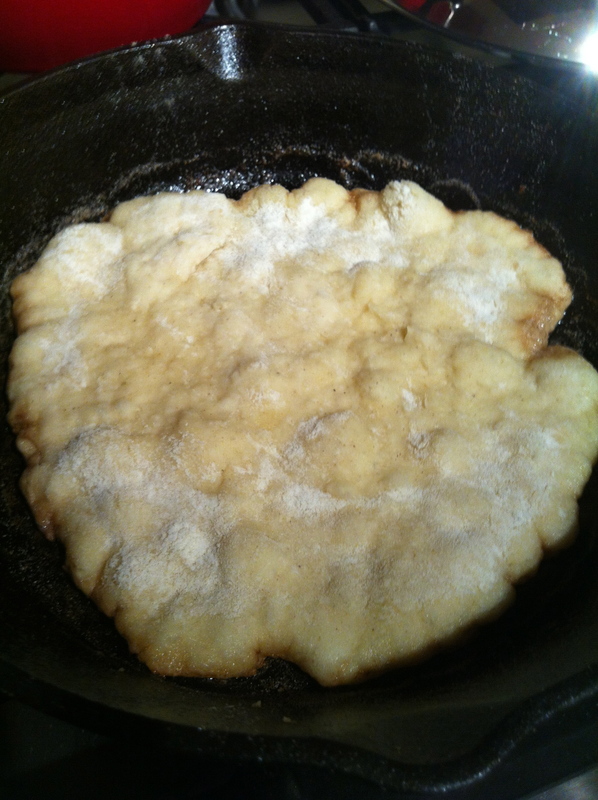 I browned the naan on one side, flipped, and browned on the other, and that was enough to cook it through. If yours is thick in spots or otherwise doesn’t seem to be cooking all the way, you can cover it and let it steam a bit. The dough is quite forgiving if you tear it on the way to the skillet. I’m certainly not advocating that you actually reach your hands down in a hot skillet to press the dough back together, but I’m just saying, I may have done so, and it may have worked. I scarfed this stuff down with some homemade rice-noodle soup that night, and it was glorious. Hope it works out for at least one or two of you, too. 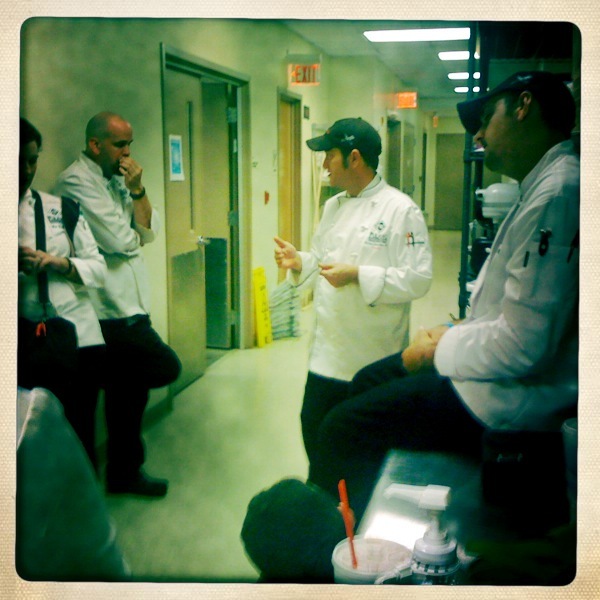 Chef G gives us a debrief at the end of the night, with corrections and praise. We are going to battle this semester. Not with each other, or (hopefully) with the chef, but with ourselves. Not to be overly dramatic, but those of us in Food Production 4 found out Thursday night just what we were in for. This semester, the school is taking Food IV in a new direction: actual restaurant service. Rather than completing individual dishes, as in previous classes, we will be serving a seven-course fine dining menu to guests, restaurant-style, every week. This would be an appropriate time for me to remind you that I’ve NEVER actually worked in food. Never even waited tables. This is a challenge, but a welcome one. We will rotate through stations found in a real restaurant, such as sauté, cold pantry and sauces. We’ll also rotate being servers in the “front of house,” serving guests (mostly donors) who have made reservations through the school. Here’s the menu, which we’ll be serving every week to a new group of guests. The chef is known for being demanding, passionate and meticulous, so we knew we’d have to have our game on. 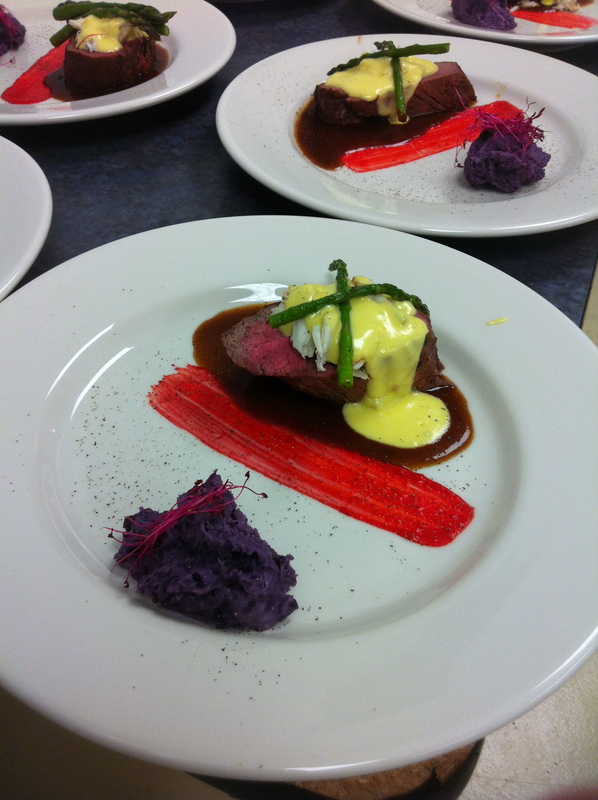 I was paired with another non-traditional student who also has no restaurant experience. But, we both do pretty well in class, so I wasn’t too worried. 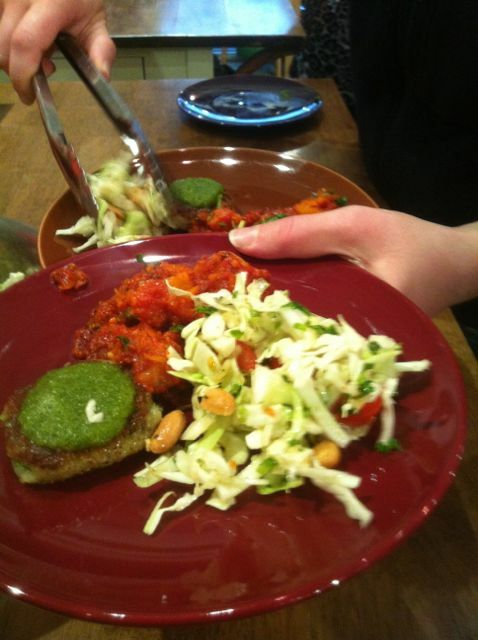 We were to be on the pantry station, making salads and cold appetizers. This doesn’t sound too hard until you realize just how many steps are involved in these dishes. The Caesar salad alone has croutons (from scratch, with several herbs that must be dusted), parmesan tuilles (also from scratch), and a dressing (yes, from scratch). We were totally buried in mise from the start, meaning a messy prep area and confusion as the night went on. And then there was the tuna tataki. The chef was (expectedly) really busy and didn’t have time to show us how he wanted the tuna seared and sliced until just before service. 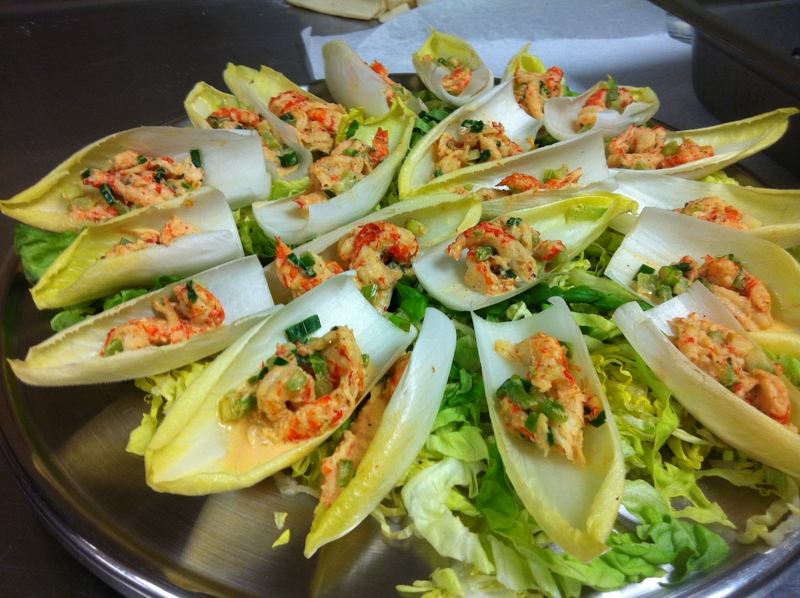 I had to finish julienning some pickled ginger, mix it with some green onion another student had “rabbit eared,” put on some dressing. Sear the sushi-grade tuna, slice thinly (I had issues, maybe bring a sharper knife next week), wrap tiny balls of the salad inside five of them, plate. 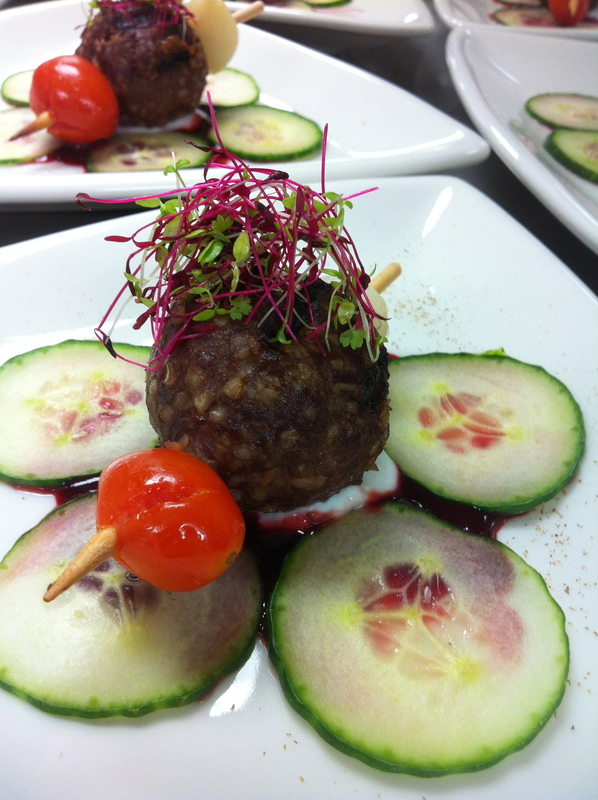 Put a ball of microgreens on the plate, dress. Spoon some of the solids from the dressing on each tuna roll, then drizzle some of the liquids across the plate. This is all happening while the chef is expediting, meaning he’s calling out the orders as they come in and making sure dishes get out on time. There’s a whole lingo to that I still need to learn. (What the heck does “all day” mean in the kitchen??) He occasionally got a little excited that things weren’t coming as quickly as he’d like, such as, er, my tuna dish. At the end of the evening, after we cleaned the last dish and wiped down the last surface, the chef had us meet up for a debrief. Even with all our hiccups, apparently we did okay. He went through each station making suggestions and praises as appropriate. Our pantry station was messy and unprepared due to poor mise (we got too excited just trying to find things in that large kitchen). But, he said, we pulled it off and got good plates out. “I can’t believe this is only the third week of class,” it read. Next week, I’m on pantry again, and I’m in charge this time. My other (fabulous) partner is rotating elsewhere, and I’ll have a new one to teach the ropes. I expect to have better mise and a better idea of how to pull things off. 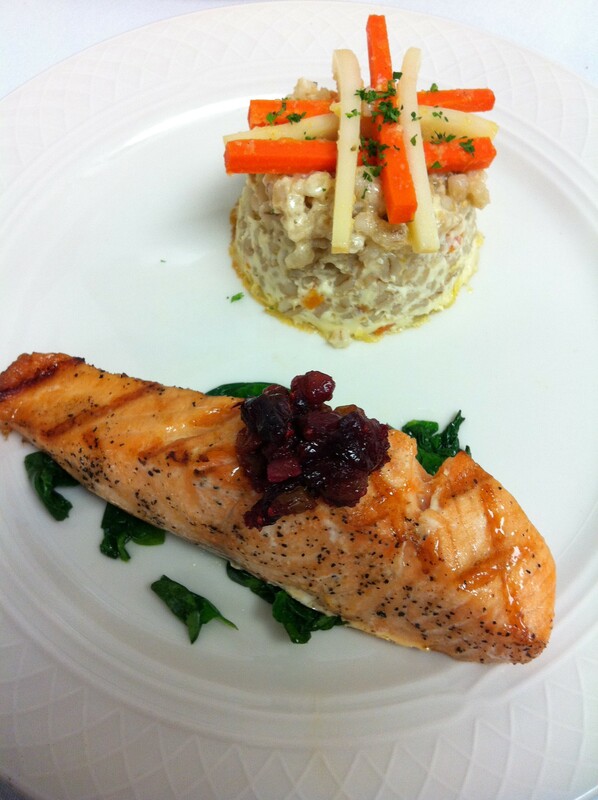 Interested in dining with us? There may still be some seats left. Call Kimberly Irizarri at (501) 812-2754. All it will cost you is a couple hours and an honest comment card.